FEB.28/LAST DAY FOR PRE-ENTRIES FOR THE TEXAS @ STEP 2019! The Jack Russell Terrier Club Of America (JRTCA - www.therealjackrussell.com) is the National Breed Club and Registry for the Jack Russell Terrier in the United States; it was founded in 1976 and is the largest Jack Russell Terrier Club and registry in the world. The Gulf Coast Jack Russell Terrier Network is an affiliate club of the JRTCA. The JRTCA is affiliated with the Jack Russell Terrier United World Federation (JRTUWF), an organization of Jack Russell clubs dedicated to protecting the working Jack Russell Terrier worldwide. Please note that the JRTCA is NOT affiliated in any way with the American Kennel Club (AKC). Please visit the JRTCA website if you own or are considering owning a Jack Russell Terrier. 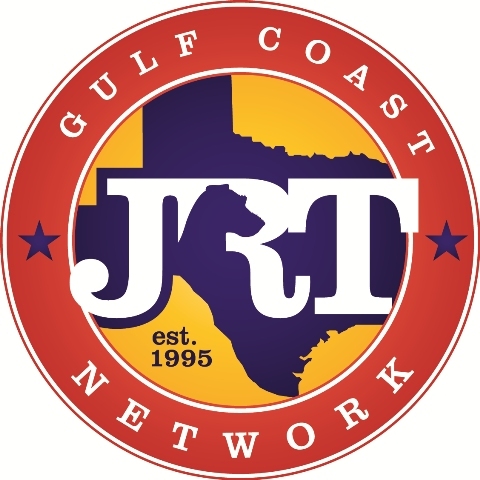 Established in 1995, the GCJRTN is a local organization based in South and Central Texas; we provide educational opportunities for JRT owners in our region to get together and socialize with each other and their Jacks. We do this by means of "Playdays," 3-4 per year, in Buffalo, TX. We school our Jacks in Racing, Lure Coursing, Tunnel Vision and Go-To-Ground, etc. No experience is necessary and we encourage and welcome new members! We also host two A-Rated JRTCA sanctioned trials each year. Our trials are held in mid-March at the Leon County Expo Center in Buffalo, Texas. If you are not yet a member of the Gulf Coast Jack Russell Terrier Network, please consider joining us by submitting your membership application today. Remember, as a member, you can advertise in our Classifieds for free and get discounted trial entry fees and ringside spots. You will receive newsletters, club updates and have access to the Member Only site on this Club website. You can become a member by clicking on the GCJRTN Membership Application Tab on the top left of the navigation screen. You can print off the form and mail it or you can pay on-line via the "Buy Now" PayPal button below. You can also pay via PayPal directly using payusnow@gcjrtn.com. We really need your support in order for our Club to grow and thrive. We are only as strong as our membership is supportive. Please consider volunteering for a BOD/Trial Committee position...we could all use Co-Chairs. Help us build depth in our Club!